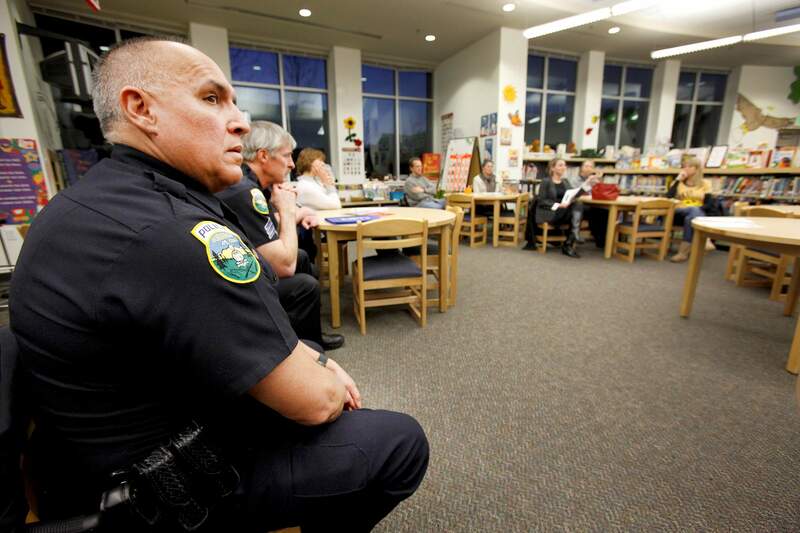 SHAUN STANLEY/Durango Herald - Denver Police Department School Resource Officer Leonard Martinez listens to Kathy Morris, Regional Safe School Coordinator at San Juan BOCES, during a Parent Safety training meeting at Riverview Elementary School. Colorado legislators missed an opportunity to reduce the number of occasions people with mental issues either turn to violence against others or do themselves harm when they voted down “red flag” legislation in the recently-ended session. With “red flag” legislation, family members or neighbors can alert law enforcement to an individual’s possible intent toward violence and ask the court for an order that would remove for a temporary period any weapons from a troubled person’s possession. Law enforcement could initiate the same action. A half-dozen states, including Florida, have “red flag” legislation in place. The bar would be a high one, however, requiring provable evidence that someone signaled multiple times or in especially deep ways inclinations to do harm. The legislation could be especially helpful in reducing suicides, which often occur during a short but particularly intense moment of depression. A gun can easily be within reach. “Temporary,” is also significant, recognizing that the individual usually has the right to possess his or her weapons. The duration varies among the states, with a year being the longest. Opposition to the “red flag” legislation considers it a “gun grab” prohibited by the Second Amendment. In not every case where someone turns to violence can warnings be recognized in hindsight, but in many that is just what happens. “If only,” is said too often. There are numerous opportunities to make gun ownership safer than it is now, and we think that gun ownership activists should be open to them. The issue so often is not gun control, but gun safety. There should be a balance between individual rights and public safety. Between now and the next legislative session, let’s track the number of tragedies that might have been avoided by separating someone who has shown significant mental issues from weapons, and again propose “red flag” legislation. Unfortunately, we expect those tragedies will occur.